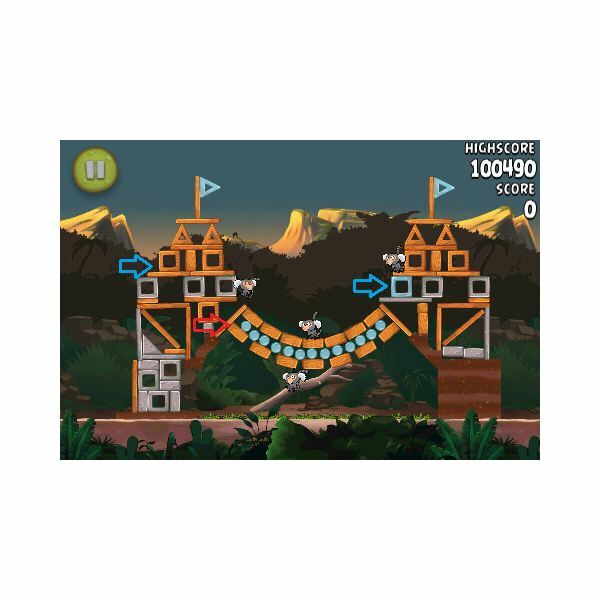 Use the first bird to fly high and fall to hit the base of the furthest structure. This should then fall to the left, tumbling each structure in turn. 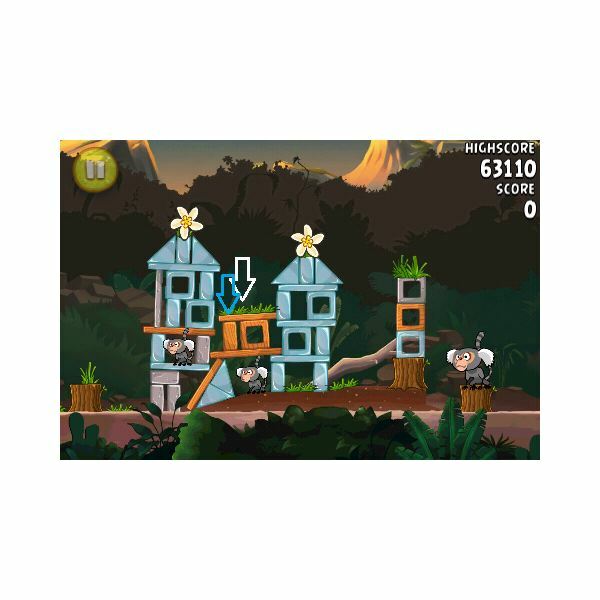 Use the first bird to hit the third structure, tapping the screen for maximum impact and collapse it. 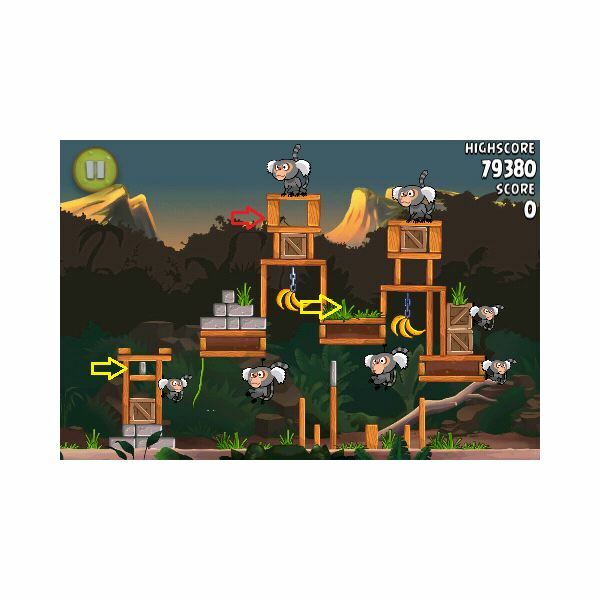 The second bird can then be aimed in the same or a similar path to take out the furthest monkey. When aimed correctly it should go through and hit the TNT causing the expolsion to throw stones at the last structures for three stars. Here, aim the bird to go through the top of the tree structure and hit the structure beyond to knock it down and kill the first two monkeys. Next aim this bird high for the highest bird to hit the flower housed in the vine, the three should fall to leave just two monkeys. The third should be aimed for the break in the tree and hit to fly through killing the last monkeys. Aim the first bird for the ridge in the structure and tap to increase speed so it hits hard. This should collapse the structure leaving just three monkeys. 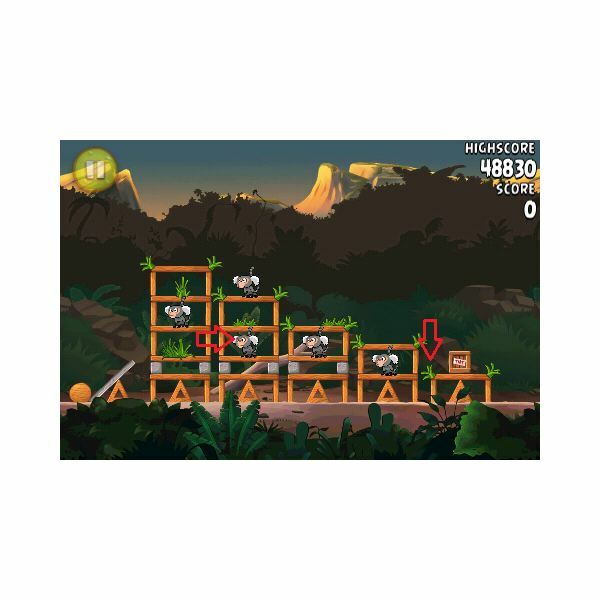 The second bird can be shot to hit the last monkey in the debris. 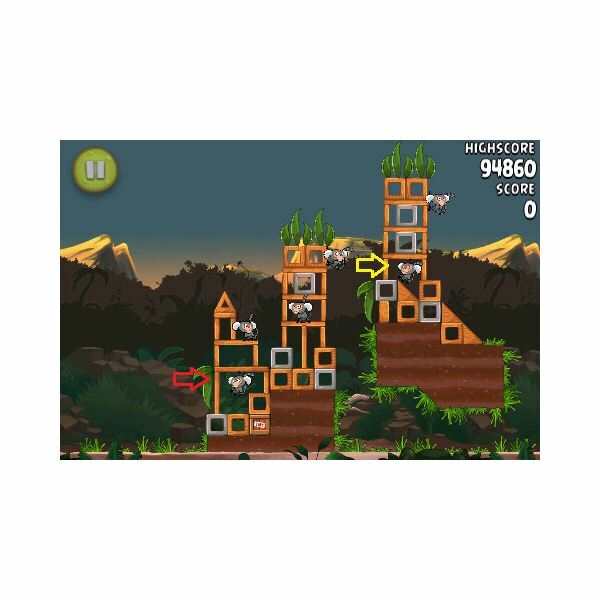 Lastly the next bird can be aimed high to hit the grey slab on the remaining tower which will cause it to fall and hit the monkeys. 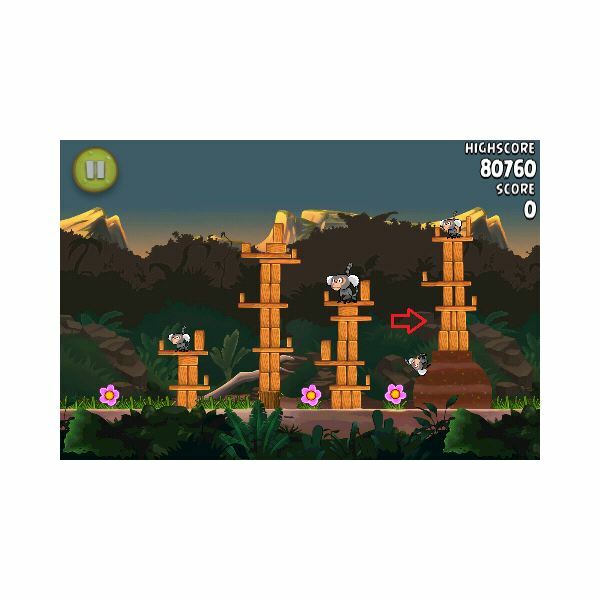 Use the first bird to hit the tallest wooden structure at the corner to kill most of the monkeys, and this should leave the two furthest away. The next bird can then be used for the remaining monkeys. 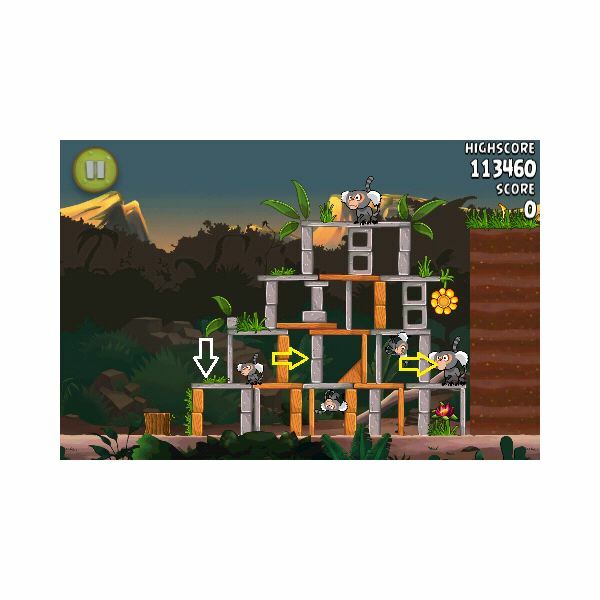 Use the first bird to fly high over the structure, dropping the egg in the middle dip to send the debris to kill each monkey in turn leaving just one. The next bird can be aimed high again to fall on the last monkey. 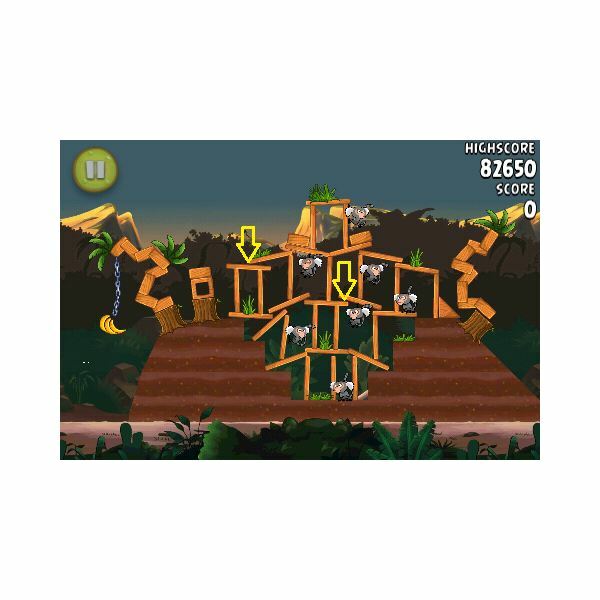 Aim the first bird at the large monkey ahead, when tapped to increase speed this should collapse the entire structure to kill all but one monkey. Use the next bird to kill the final monkey. Fire the first bird into the fruit to collapse the first side of the structure. 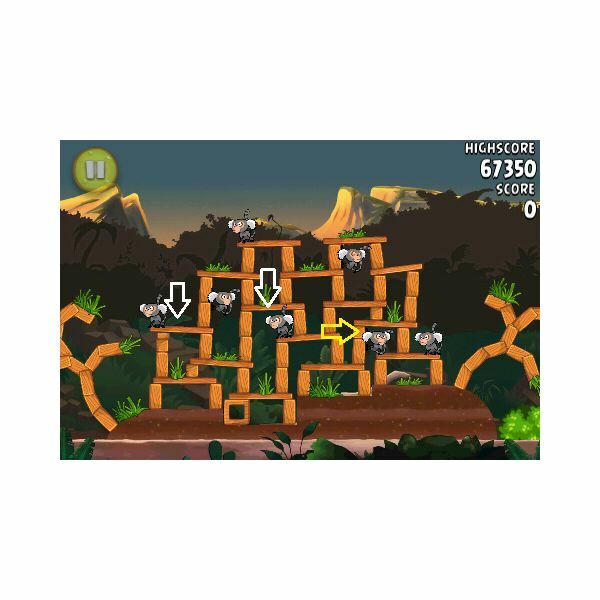 The second bird can then be sent high to fall into and shoot the middle dip in the structure killing all but one monkey. 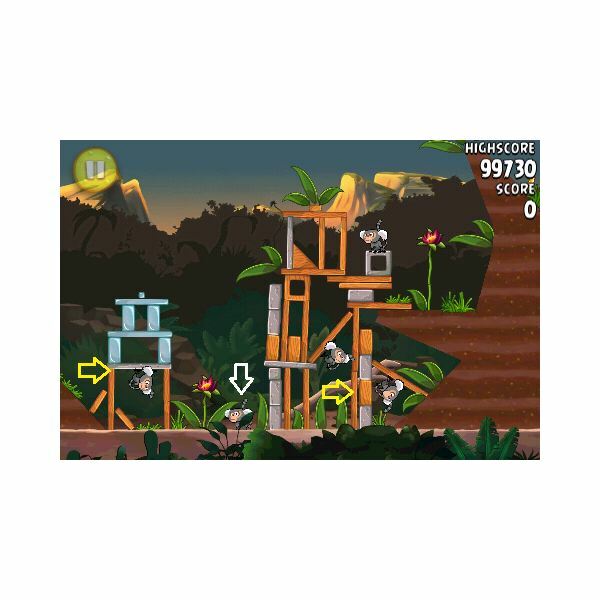 Simply use the last bird to shoot at the final monkey. The first bird can be aimed at the wooden structure which will rock but not collapse. 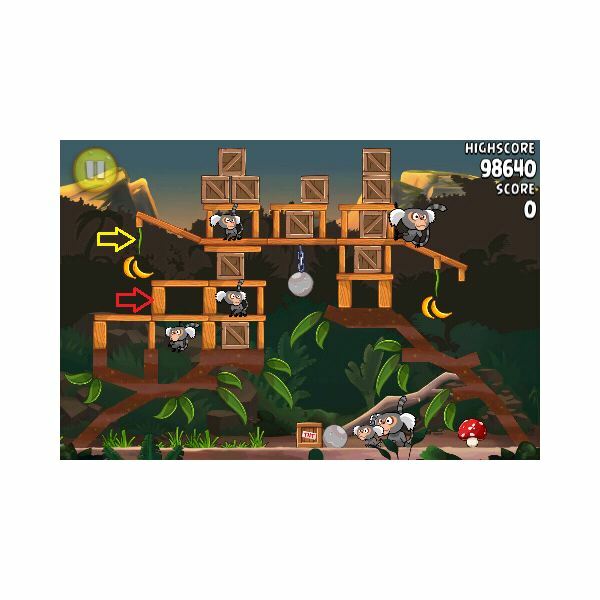 Aim the second bird in the same path to destroy the supporting plank and collapse it completely killing the first monkey. 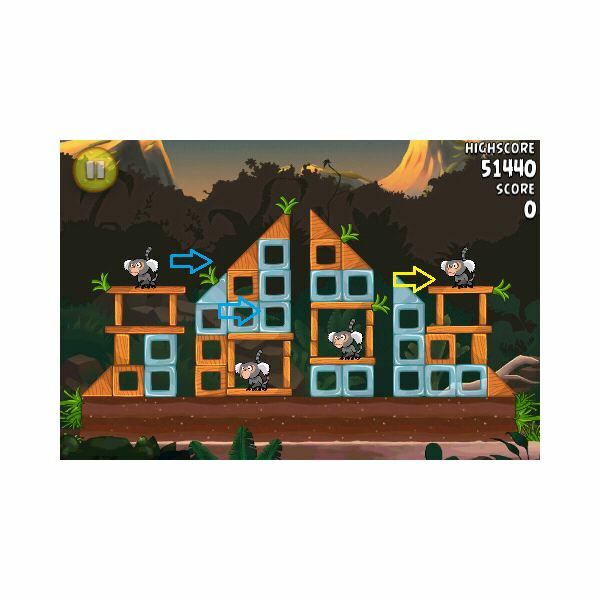 The next bird can now be shot high for the blue square to collapse the furthest structure. 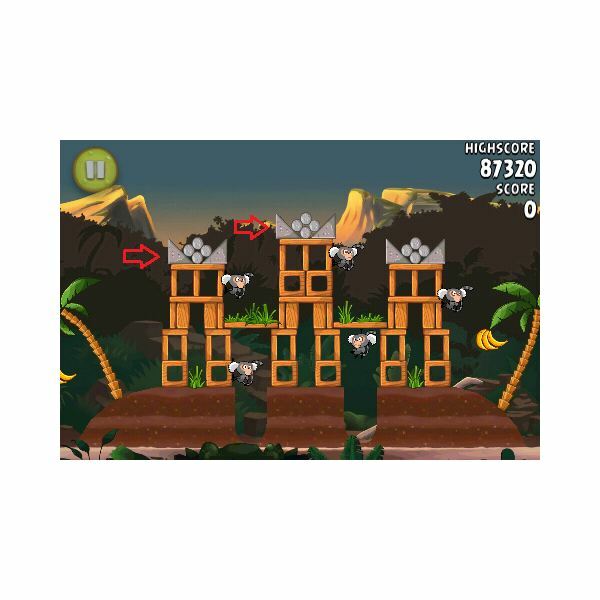 At this point there will be one monkey left, so shoot the final bird for the bridge support plank which will break, giving you three stars. Fire this bird for just under the bananas to clear a path. 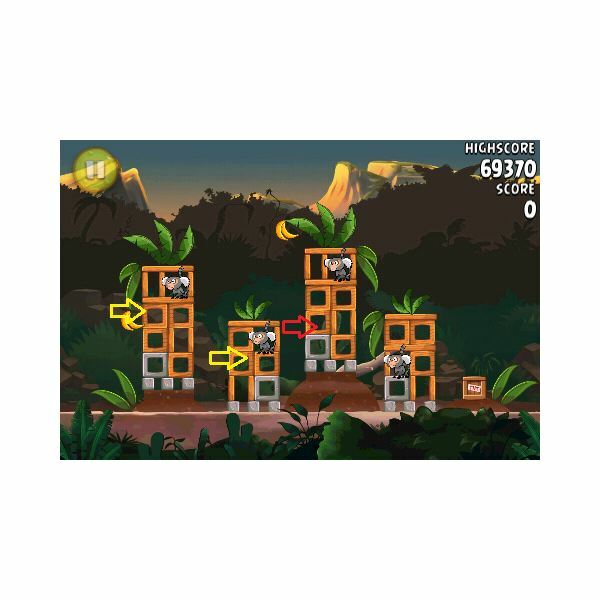 Aim the second bird a bit higher to go through the vines holding the bananas up, with increased speed this should go through the box beyond to cause a cascade of effects. 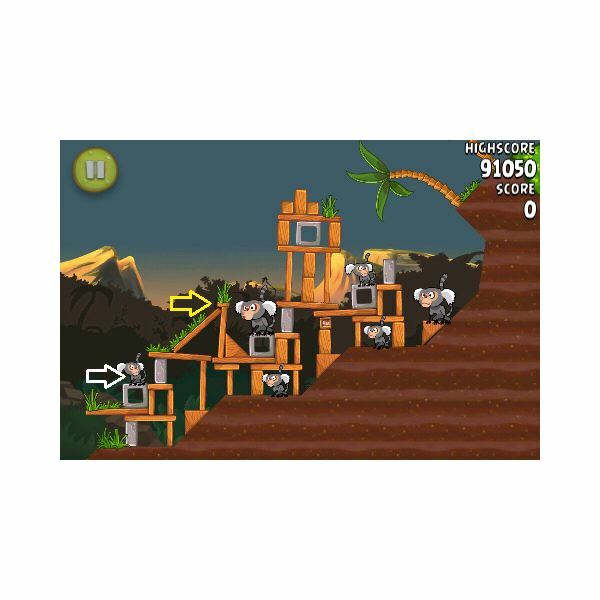 The structure will collapse and boulders will fall to detonate the TNT box and each monkey will be killed. Aim this bird high to fall just next to the TNT box which will break the supporting plank and fall. The explosion will then collapse the structure leaving one monkey remaining. Aim the next bird for the last monkey. Fire the first bird at the monkey perched on its head to kill it and follow through to hit the middle structure. It will then collapse on the monkeys caged inside. There should be a monkey remaining so aim for it for three stars. Shooting the bird high into the air, it should fall with increased speed to take out the furthest structure which will fall into the next. 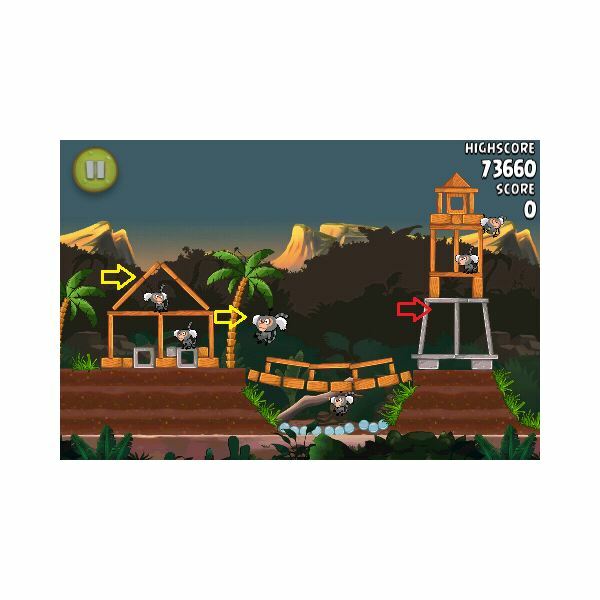 The next bird can then take out the last monkeys by hitting the side of the tower. 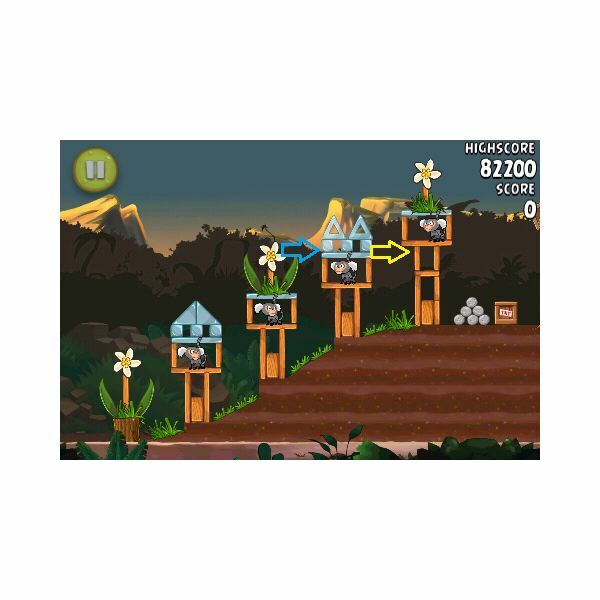 This can be done in two shots, simply shoot the bird high into the air to fall on the side planks and the increased speed should collapse the whole side. 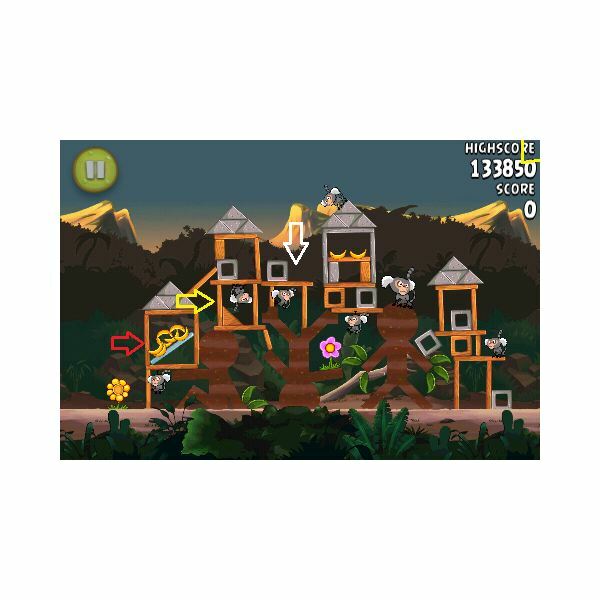 Aim the next bird high as well to shoot through the other side of the structure to kill the last monkeys and gain a three star rating. Aim the first bird low, just as it is about to hit the structure shoot the egg and the impact of both will collapse the side. The next bird should be aimed for the supporting bricks to collapse it further. The last bird can now be shot at the remaining monkey. 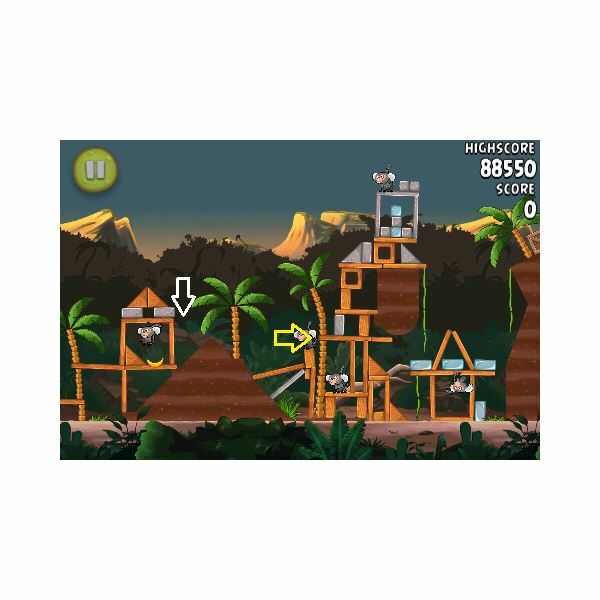 Go to page 2 for the Theme 4 walkthrough for Angry Birds Jungle Escape! Aim the first bird high as if to directly hit the tree on what looks like a boat. This will send birds flying in different directions, detonating the TNT box and killing the first two monkeys. The second bird can then be hit to kill the monkey resting on what is left of the boat, at the same time killing the monkey in the tree. Lastly, for a three star rating, aim the final bird at the remaining monkey. 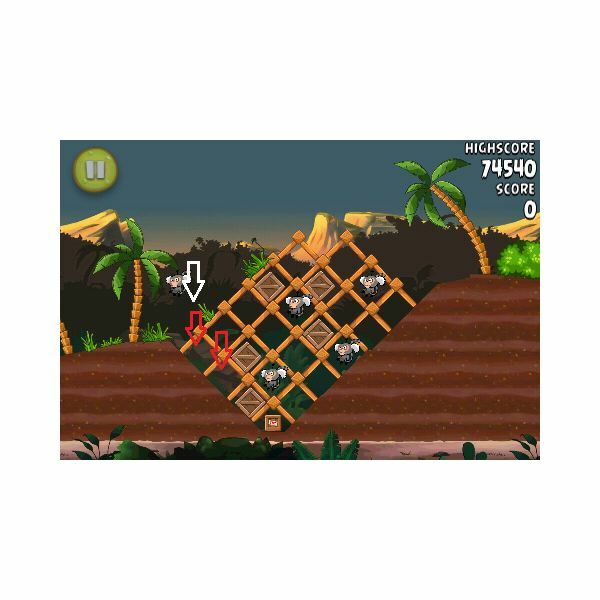 Use the first bird to take out the nearest structure and kill the monkey enclosed. 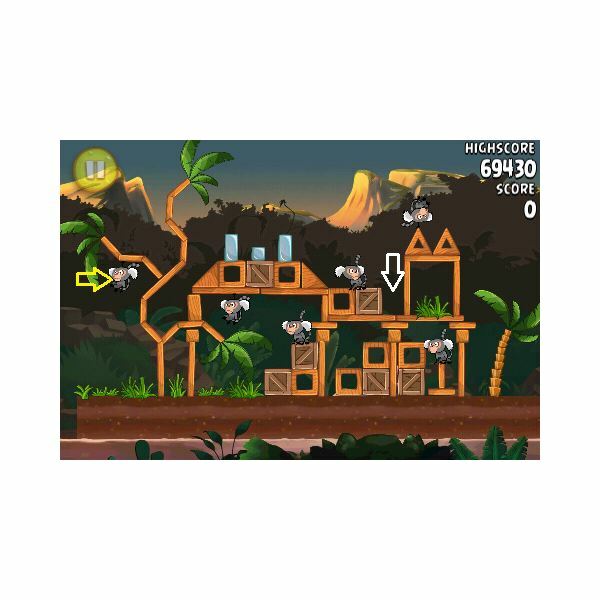 Aiming low again, aim the second bird directly for the next exposed monkey and as it's about to hit tap to drop the egg and the impact should collapse most of the structure, leaving one monkey. Hit the last monkey with the third bird. Aim the first bird high to fall to hit the gap in the strucutre to the right and tap just before it hits for maximum impact to collapse it. 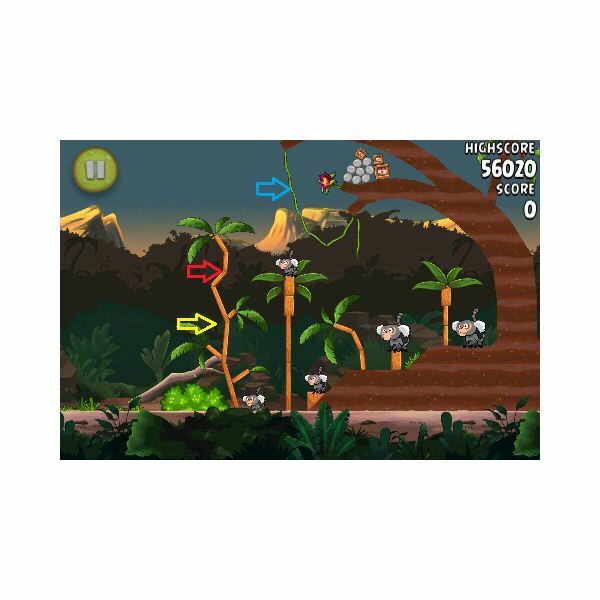 There will be two monkeys left at this point so use the next bird to aim for the closest and tap before it hits to go through and kill the last one. 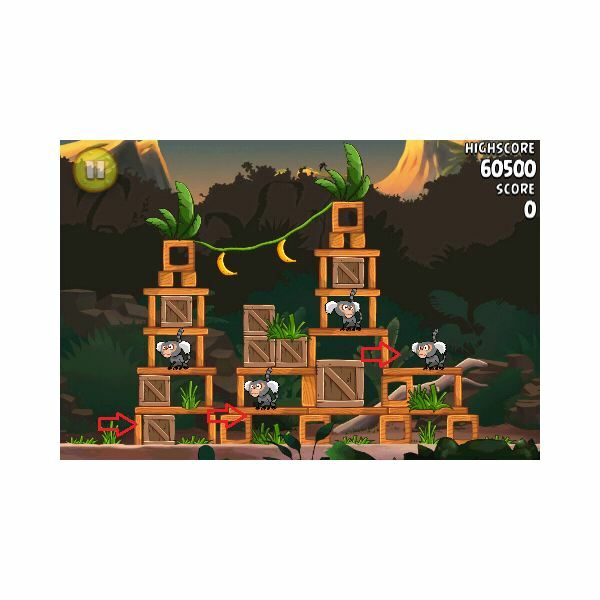 Use the first bird to hit the blocks holding up the first structure to kill the first monkey. The second can be aimed high to fall and detonate the TNT box housed in the second part of the structure. The resulting impact should then kill the monkeys housed on that side. The last should be shot just over the closest bird to go through the enclosure, collapsing the final part of the tower and killing the monkeys enclosed. Shoot the first bird to crash through the joint in the roof of the house type structure to kill the first two monkeys. Next aim for the monkey housed in the tree. Lastly, shoot the final bird high so that it falls on the corner of the grey tower to collapse it on to the bridge and kill the final monkeys. 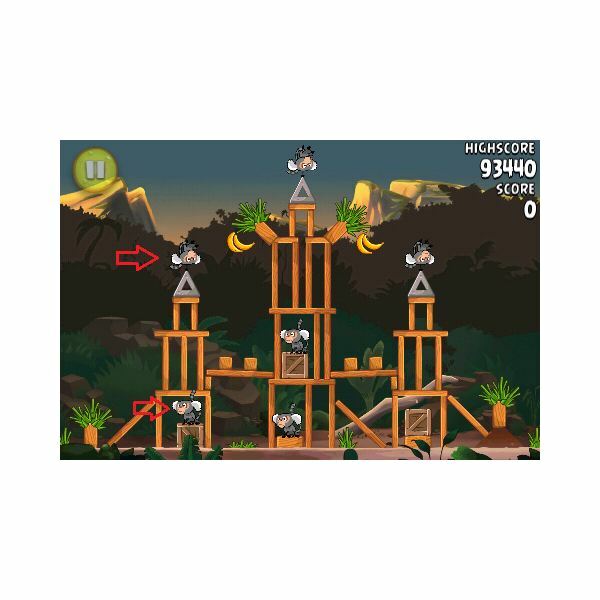 Use the first bird to hit the top of the tallest tower, causing it to topple and take out all but two monkeys hiding. Shoot the next bird into the tower debris and this will hit the monkey swinging underneath. 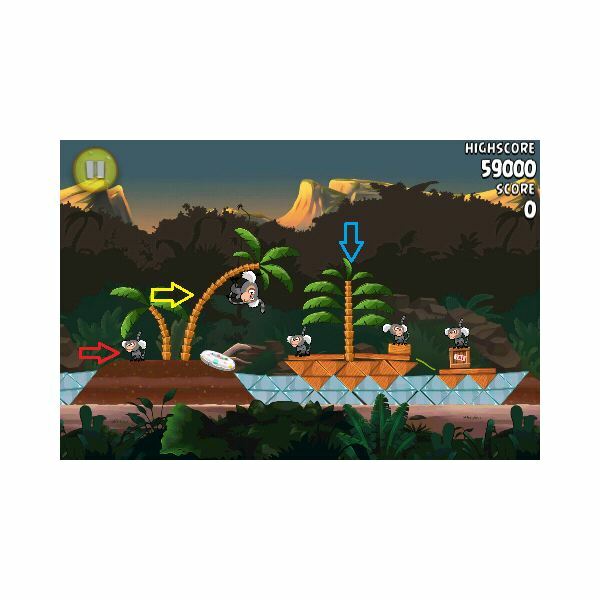 Use the last bird to hit the final monkey. Aim the first bird for the grey slab on the middle tower to drop the stones, collapsing two towers. The next bird should follow on, hitting the last slab so the stones hit the remaining monkeys. Fire this bird high and drop the egg in the space between the first two towers to collapse them both. 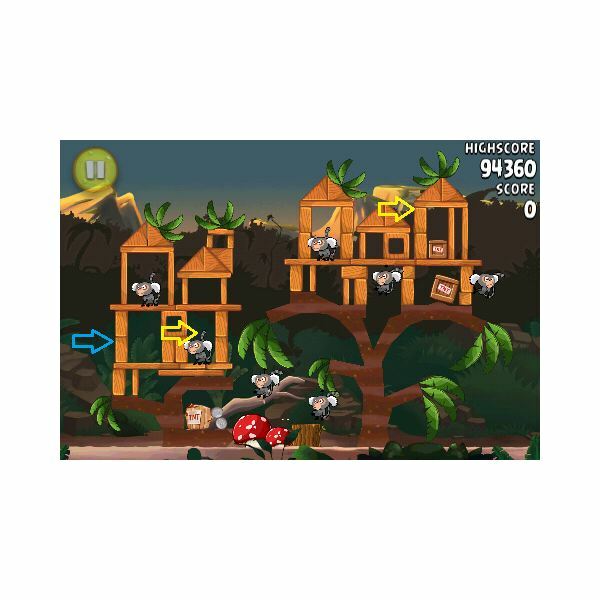 The second bird can now be aimed for the closest monkey in what is left of the second tower. The third should follow the same path knocking the debris to kill the monkeys remaining. Use the first bird to hit the tower directly in front to collapse it. The second can be fired in the same path to do the same to the second tower. The third should then be shot to the bottom of the final tower to kill any remaining monkeys. Aim this bird high to fall to the front of the structure and before it hits drop the egg to kill the monkey in the tree and take out part of the structure. Again aim high for the second bird, it should hit the front of the structure killing all but the monkey enclosed in the far part. Shooting the third in a similar path yet again, it should plough through the debris which will kill the final monkey. Aim the first bird for the closest step of the structure to destroy half. Do the same with the next bird to clear everything but a small part to the rear. Aim the final bird for the last monkeys for three stars. Aim the first bird for the box at the bottom of the first tower to collapse it completely. The second bird should then be aimed for the bottom of the second tower to do the same. Now just aim the last bird for the lone monkey left over. Shoot the first bird at the closest side of the ascending structure to knock it and collapse the top of it, there will be monkeys enclosed in the rubble. 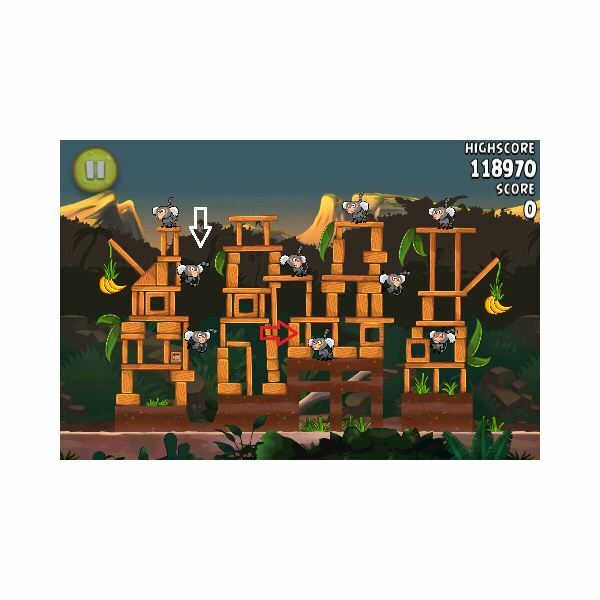 The next bird should be shot at the debris, destroying part and falling the rest, this will kill the enclosed monkeys. Aim the last bird at the remaining exposed monkey. 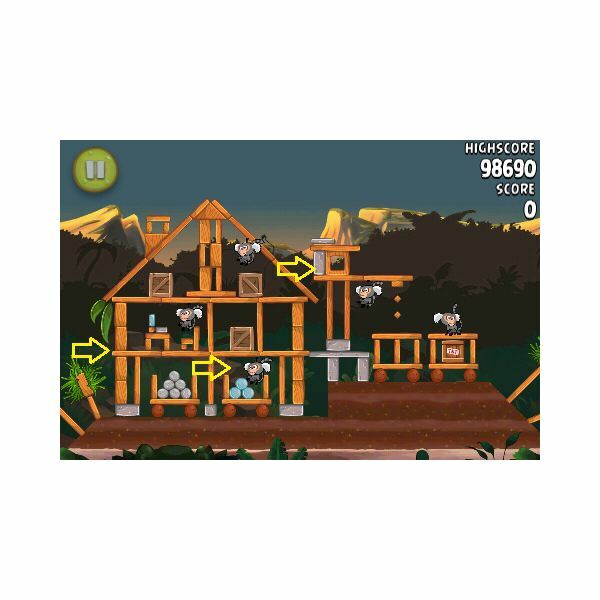 This one can be a little tricky, so firstly aim the bird very high into the air to fall next to the closest monkey and just before it hits drop the egg to kill the monkey and the bird itself will fly to knock the structure above the rest with the debris falling on the monkey below. Aiming high again, shoot this bird high to fall to kill the two remaining monkeys. 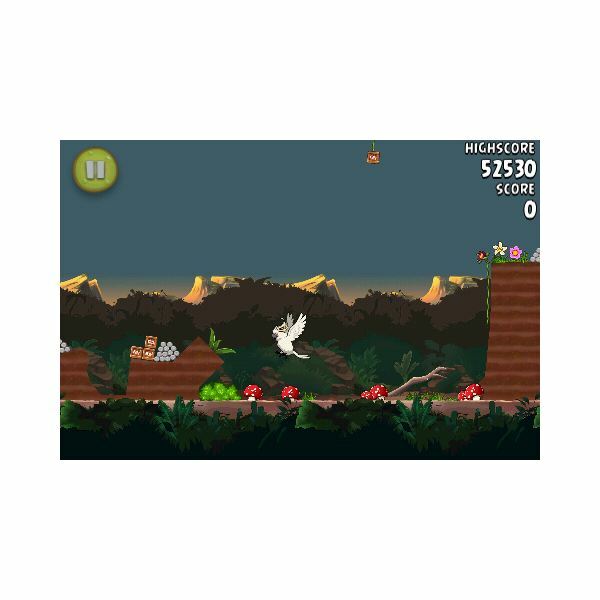 This level is a little different than the rest, aiming to kill a bird of prey you'll need to firstly have in your mind the path it takes and use the birds to keep hitting it. Wait until the bird begins to ascend before shooting the first bird to land in its path. It should then fly in a backward circle, and on the ascent again aim the next bird for the TNT box which will send stones flying in its path once again. 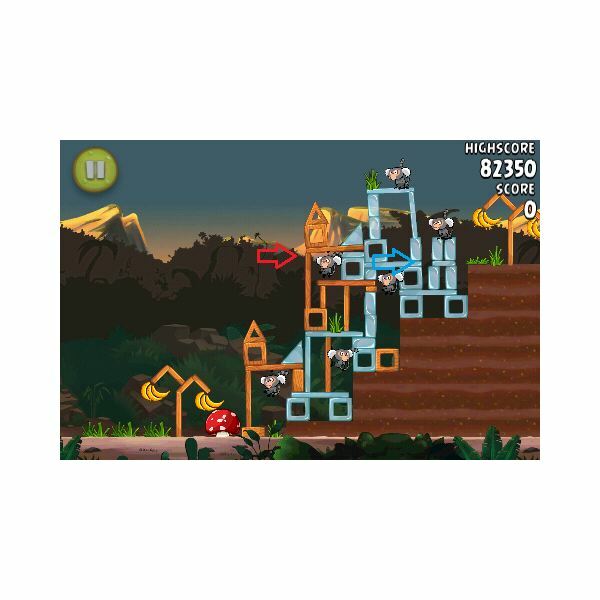 Aim the next bird low and they will bounce off the mushrooms and rise up to hit it once more and bounce to hit the second TNT box causing the stones to scare it off. There are lots of ways to complete the final level so just keep trying if you don't get it first time! Do you have another way of completing any of these levels? Post a comment and share it with us! All references and screenshots from Angry Birds Rio on iPhone.